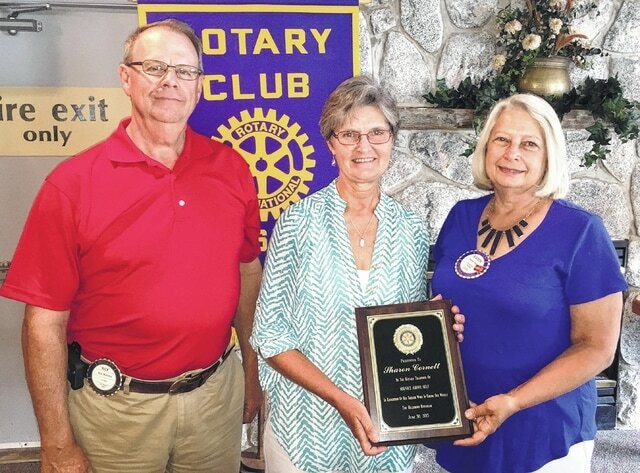 Sharon Cornette, center, was honored at Tuesday’s meeting of Hillsboro Rotary for her service as the club’s bulletin editor, which includes tracking such club activities as birthdays, fines, program recaps, absences, makeups and other events, and compiling them into a bulletin that is emailed to members and handed out at meetings. At right is immediate past Rotary president Karen Faust, and at left is new president Rick Williams. Cornette also serves on the Hillsboro Rotary board of directors.